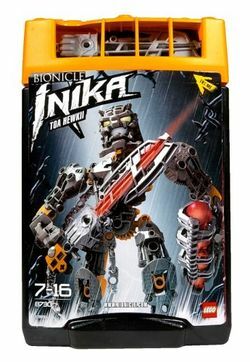 8730 Toa Hewkii is a BIONICLE set released in 2006. It contains Hewkii as he appeared as a Toa Inika. Hewkii is one of the six Toa Inika. This is Hewkii's second appearance in a set (third including his appearance as a set that came with a Happy Meal at McDonalds). It contains Hewkii, his Laser Axe that lights up, Climbing Chains connecting his shoulder to his axe and run off the axe, and a Zamor Sphere launcher. His head glows in the dark. In the BIONICLE storyline he was a Toa of Stone. He wore the Sanok, the Great Mask of Accuracy. He was transformed into a Toa by a bolt of lightning from the Red Star. This is a description taken from LEGO.com. Please do not modify it. (see an archive of the product's page) Enemies are in for a shock! Toa Inika Hewkii can beat an enemy with the power of his stone-lightning blasts, laser axe or zamor launcher – or he can use his Kanohi Sanok, the Mask of Accuracy, and turn virtually anything that can be thrown into a weapon! The Toa of Stone’s laser axe lights up with a strobe effect! This is the only BIONICLE set to ever have titanium metallic as its main colour. He includes a chain piece that is used in 2012 Hero Factory theme for hero cuffs. Facts about "8730 Toa Hewkii"
Enemies are in for a shock!